Vintage Masters is due out for Magic Online next month, and is getting the full preview treatment on the Wizards of the Coast mothership this week. While we are not alone in our past and current criticisms of both the MTGO platform and the product management itself, Vintage Masters will at long last provide the online gaming community with a chance to play Vintage online, any time and any place (well, at least when MTGO is fully operational). While there are many obstacles for WotC’s developers to overcome with their current ongoing development of the online platform, MTGO offers a rules enforced and non-hackable way to play Vintage for users around the globe (unlike other archaic free software like Cockatrice and Magic Workstation), as well as online tournaments that may eventually operate as a more frequent proving ground for ideas and decks. Why is this important for Vintage (and Legacy, to a lesser extent)? Because with the rarity and rising cost of real life cards like Black Lotus, Underground Sea, Mana Drain, and beyond, the digital realm offers a chance for these formats to grow without the shackles of the Official Reprint Policy (aka The Reserved List), with prizes and potentially large scale and frequent tournaments to support them. With that being said, Vintage Masters is scheduled to be released for Magic Online in about a month, on June 13 2014. WotC is running a number of feature columns this week as they unveil the new set, and we’ll collate all of these new previews and stories from there and elsewhere into this single page for easy reference, which we’ll continue to update as new pieces to the puzzle are revealed. @MTGOAcademy @enderfall The cards will have modern frames. The P9 and dual lands will have Cube / Vintage Champs art. Yawgmoth’s Will Revealed by Mark Rosewater – In a post about the making of Magic, MaRo revealed that Yawgmoth’s Will be will included in Vintage Masters. There’s no word at this time if it’s the original art or new artwork. Vintage Masters Introduced – Initial product details announced (last Fall). Oath of Druids Revealed by GatheringMagic.com – Vintage all star Oath of Druids is confirmed today in Carlos Gutierrez’s column on GatheringMagic.com, and will have the original art in modern frame. City in a Bottle, Bazaar of Baghdad, Desert Twister, Erhnam Djinn, Library of Alexandria, and Serendib Efreet Revealed by Trick Jarrett – In an article detailing how City in a Bottle works, Trick Jarrett also announced that a number of cards from Arabian Nights will be included in Vintage Masters. Circular Logic, Arrogant Wurm, and Goblin General Revealed (as Commons!) by Gavin Verhey – In Gavin’s Pauper-related column he reveals that ‘Madness and Goblins are both common archetypes you could draft in Vintage Masters,’ so are also likely to see cards like Wild Mongrel, Basking Rootwalla, and probably some combination of Reckless Wurm, Fiery Temper, Careful Study, and Looter Il-Kor. Force of Will Revealed by WotC on Twitter – In a Tweet from WotC, Force of Will was revealed with the Legacy Champs art and modern frame, at the rare level. This should finally lower the price of Force of Will more than just a little like the MOCS promo. Chaos Warp Revealed by WotC on Twitter – In another Tweet from WotC, Chaos Warp was revealed with the Commander art and modern frame, at the rare level. Memory Jar Revealed by WotC on Twitter – In yet another Tweet from WotC, Memory Jar was revealed with the original art and modern frame, at the Mythic rarity level. Will we see Tinker to match it? Will Storm be a prominent archetype in Vintage Masters? 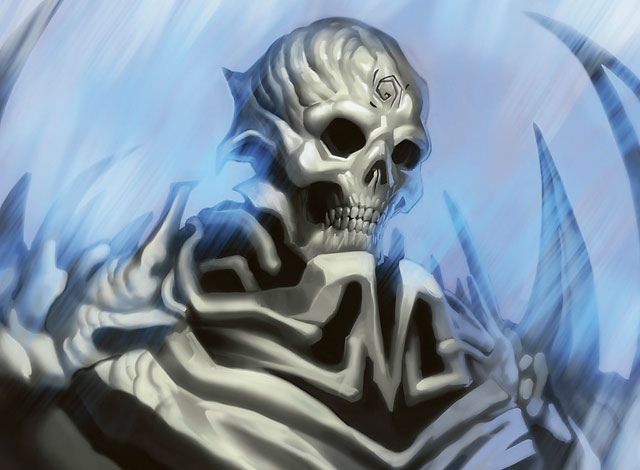 Living Death Revealed by WotC on Twitter – Living Death is coming out with new artwork by Mark Winters in the modern frame, at the rare level. We may see additional cards like Reanimate or others to support a Reanimator archetype in the Vintage Masters limited format. Balance and Skullclamp Revealed by WotC on Reddit – In a post on Reddit the WotC support team revealed Balance with the alternate art and modern frame, and Skullclamp with new artwork by Daniel Ljunggren, both at the Mythic rare level. Nature’s Ruin Revealed by WotC on Twitter – In a Tweet from WotC, Nature’s Ruin was revealed with the original art and modern frame, at the rare level. This means it’s likely that we’ll also see Virtue’s Ruin printed, as it has also appeared in Vintage Top 8’s occasionally over the past few years. Goblin Goon Revealed by WotC on Twitter – Continuing a stream of Tweets another goblin was revealed, with the original art in modern frame, at the uncommon level (rather than rare, as it was previously printed). Tolarian Academy Revealed by MTGOAcademy – AJ Walls of MTGOAcademy.com revealed Tolarian Academy with the original art in modern frame, at Mythic rarity. There’s no word yet on Gaea’s Cradle or Serra’s Sanctum, but Gaea’s Cradle is the MOCS Promo for June. Teroh’s Faithful, Predatory Nightstalker, Battle Screech, Elephant Guide, Temporal Fissure, Solar Blast, Tyrant’s Choice, Reanimate, and Yavimaya Elder Revealed by WotC – In Marshall Sutcliffe’s Limited Information column he spills some goodies (including a few cards with new artwork), as well as describing a number of archetypes in Vintage Masters limited, including Madness, Control, Attrition, Weenies, “Little Kid,” Storm, Counterburn, Rakdos Aggro, Fatty Ramp, and potentially Reanimator. Demonic Tutor Revealed by Aaron Forsythe on Twitter – At Mythic rarity, Demonic Tutor will be printed again on MTGO, with the alternate art seen before in the boxed set. Time Vault Revealed Here on Eternal Central! – New alternate artwork for Vintage powerhouse Time Vault, spoiled right here on EC! Although Voltaic Key will not be in Vintage Masters (because it was printed in a Modern-legal set), this will be great to get an alternate art Time Vault and to dump more copies of them into the system to keep the price affordable. Jace, the Mind Sculptor Revealed on StarCityGames – Cedric Phillips’ new column reveals that big daddy Jace is coming back around, with the original art and modern frame. The hits keep on coming! Recurring Nightmare Revealed by WotC – Original artwork in the modern frame, at rare level. Don’t be surprised if we also see Survival of the Fittest to match it. Magister of Worth Revealed by Worth Wollpert on Twitter – Spoiled at rare level, this won’t make much of a splash in Vintage, but may be sellable to EDH fiends. Goblin Settler Revealed by WotC on Twitter – Will still have no impact on Vintage, but is yet another EDH card, at the uncommon level. Yawgmoth’s Bargain Revealed by Mark Rosewater on Twitter – Already released online in Urza’s Destiny, this time it’s got the same art but modern card frame, and at Mythic rarity. Be sure to check back to this post as we update it with new previews news about the new set from around the Web. Brago, King Eternal and Selvala, Explorer Returned Revealed by WotC – Both at rare level, these will make no impact on Vintage and are probably here strictly to grab EDH players in draft rooms. Basandra, Battle Seraph – At the rare level, this is just more EDH fodder, unfortunately. Channel, Kaervek’s Torch, Mana Crypt Revealed by ChannelFireball – Channel is being released with the FTV art at Mythic rarity, Torch is coming with the original art at uncommon (making it very splashable in limited), and Mana Crypt will be at Mythic rarity with the Judge Promo artwork. Hopefully this will help the price of Mana Crypt subside just a little bit. Upheaval Revealed by PureMTGO on Twitter – With the original art at Mythic rarity. Wheel of Fortune Revealed by WotC on Twitter – The Judge Promo art for Wheel of Fortune will ring in at Mythic rarity. It seems like it will be difficult to draft Storm as an archetype when all of the bombs are Mythic or higher rarity. Mana Drain Revealed on StarCityGames – David McDarby’s column on SCG revealed that Mana Drain will be coming in at Mythic rarity, with new artwork by Mike Bierek. This feels like it should have been at rare level, both for price, and because it wouldn’t be so so overpowering in limited formats at rare. Ichorid Revealed by WotC – Ichorid is in, with the original art and at the rare level. This is another card where a lower rarity would have made sense (say, uncommon, where it still would have been pretty average at best in limited formats). Eureka Revealed by WotC – Eureka is also in, with new artwork by Ryan Pancoast, and at the Mythic rarity level (no doubt for limited purposes). Shouldn’t make much of a Vintage impact, since it’s already been around forever. Mishra’s Workshop Revealed by ClassicQuarter – The good folks at CQ have spoiled Workshop as a Mythic, with the Holiday Cube art by Sam Burley. This should hopefully alleviate the price of Workshop a tad (although at Mythic rarity it won’t drop it to super cheap levels, unfortunately, just like Mana Drain). Decree of Justice, Kongming, Sleeping Dragon, and Morphling Revealed by WotC on Twitter – Morphling is at Mythic rarity with the original art, while Decree and Kongming are at the rare level, with the original art. Dack Fayden (Re-Revealed) on Twitter by WotC – Confirming what we already new with this Tweet. Sylvan Library Revealed by WotC – Brian David Marshall’s new column reveals Sylvan Library at the rare level, with the FTV artwork by Yeong-Hao Han. Astral Slide Revealed by WotC – In LSV’s column he reveals Astral Slide (with the original artwork) at the uncommon level. Look out for Lightning Rift and the cycling lands to also be included (probably at uncommon and common, respectively), to make them worthwhile in the Vintage Masters draft format. Lion’s Eye Diamond Revealed by WotC – Using the MOCs Promo art by Lindsey Look, LED will be in the set at Mythic rarity. Prices on MTGO for LED have already begun to drop noticeably, and this is a month before the set is even out. LED may once again be affordable! Cruel Bargain, Parallax Wave, Hulking Goblin, and Goblin Commando Revealed by WotC on Twitter – Bargain and Parallax Wave are ringing in at rare level with the original artwork, while both Goblins will arrive at common with their original artwork from Starter. Vintage Masters Prerelease & Release Events Announced, and #VMA Will Be on Sale Until Release of Khans of Tarkir – WotC has announced the prerelease and release Limited events for Vintage Masters, and also announced and re-confirmed that it will be on sale in the online store until the release of Khans of Tarkir. WotC Releases Rarities of Cards in Vintage Masters – broken down by rarity level. FULL VINTAGE MASTERS VISUAL SPOILER Released on Reddit – WotC still has not updated their official VMA gallery with the correct card images in Gatherer, but someone pulled all of the images from the MTGO Closed Beta client and posted them nicely on Reddit/Imgur. Enjoy!